The Federal Economic Development Administration awarded Region Nine Development Commission funding to develop and implement the first-ever South Central Minnesota Agriculture Resilience Plan. Region Nine Development Commission partnered with the Minnesota Department of Agriculture, Minnesota State University, Mankato, and South Central College to create an agriculture resiliency plan as well as host informational sessions to support farmers in the region. The primary goal of this project was to provide the local agriculture community with resources and information that will create a resilient and vibrant agricultural community in South Central Minnesota. 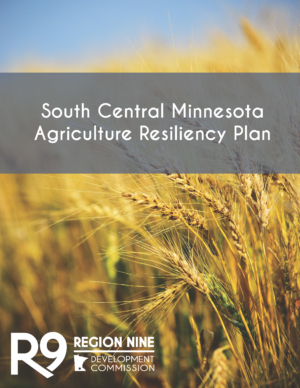 The South Central Minnesota Agriculture Resiliency Plan is was open for a 30-day review and comment period between January 28, 2019 – Frebruary 28, 2019.